A special post by Jenni Smith an early trustee. Fiona Hills first joined founders Patrick and Joan Laurance in their spare room/office at Hill Close, Hampstead Garden Suburb in 1975. At that time Pat and Joan were running highly successful coffee mornings but were beginning to think that there was a bigger scene of fundraising “out there”. Fiona lived locally and, following a career in national journalism and bringing up three children, she was keen to be involved in something demanding. Fiona became the charity’s first administrator and was responsible for the smooth running of the office and liaised with social workers and other referrers about how to access a holiday for a family. She also followed up the decisions made by a group of volunteer child-care professionals who, together with Patrick and Joan, met regularly in the Hill Close sitting room to discuss family referrals. These were very interesting meetings using referral forms developed by Fiona and sent out to social workers and care workers on request. Fiona then acted on the group’s decision in awarding grants using Joan’s strict criteria and sometimes had to give the sad message of …”perhaps next year”.For many years Fiona studied lists of trust and foundation funds and applied successfully for grants. She liaised with national newspapers and luckily, since she had been a journalist before her marriage, she had numerous connections. She succeeded in obtaining articles in the Guardian, The Times, and women’s magazines which helped raise the profile of the charity. She was also instrumental in arranging at least one edition of Radio 4’s Week’s Good Cause. Fiona was always on duty at the Summer Fairs in Hill Close and the Suburb’s Square and did a splendid job of selling Pat’s “Meals for Two” fundraising envelopes that might contain a voucher for a fish & chip supper or, if you were lucky, a dinner at the Savoy! Fiona was involved in supplying details of personnel who became the charity’s first trustees, which culminated in the Family Holiday Association becoming a registered charity. The trust deed was drawn together by local resident and lawyer Denis Ross who himself became a trustee. Trustees came came from a variety of backgrounds including finance, broadcasting, education, social work and the travel industry. Fiona dealt with the frequent changes of personnel and remembers other interesting people from the charity’s early years who are no longer with us or in touch. Personalities such as Vincent Hannah of the BBC, who was a chairman of trustees, the well-known MP Gerry Fitt who was a great supporter and the still fit and healthy Jeremy Muller who set up the 18 – 30 holiday group and was a hard working and effective trustee. During the past 40 years so many people have been involved and have made a great contribution to the charity. Fiona worked tirelessly to further its progress and improve the charity’s finances. 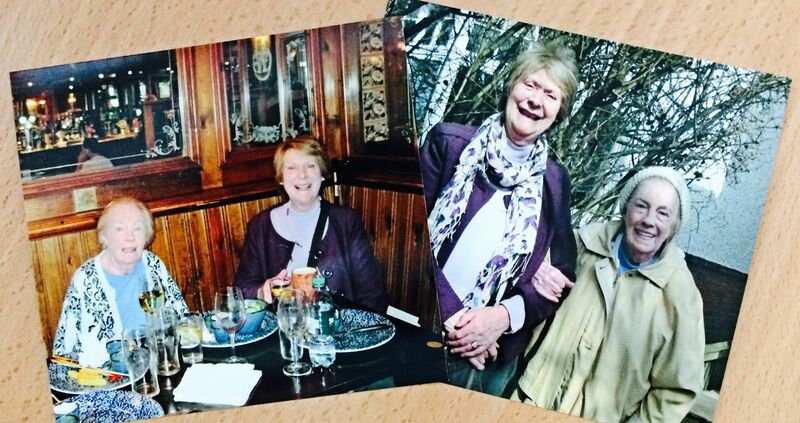 Fiona, like Joan and Patrick, loved what the charity was achieving and she remembers her early involvement from 1975 to the late 1990s with affection and pride.